Full Conference Registration for Thursday and Friday. Registration may be handled by one person, but full information is required for each attendee. Questions? Please contact Danielle at dsemsrott@bentonvillear.com or (479) 271-6827. Conference Registration Refund Policy: Cancellations received prior to March 7th will be given a 75% refund of the registration fee. After March 7th, no refunds will be given. Eligible refunds will be issued after the conference date. 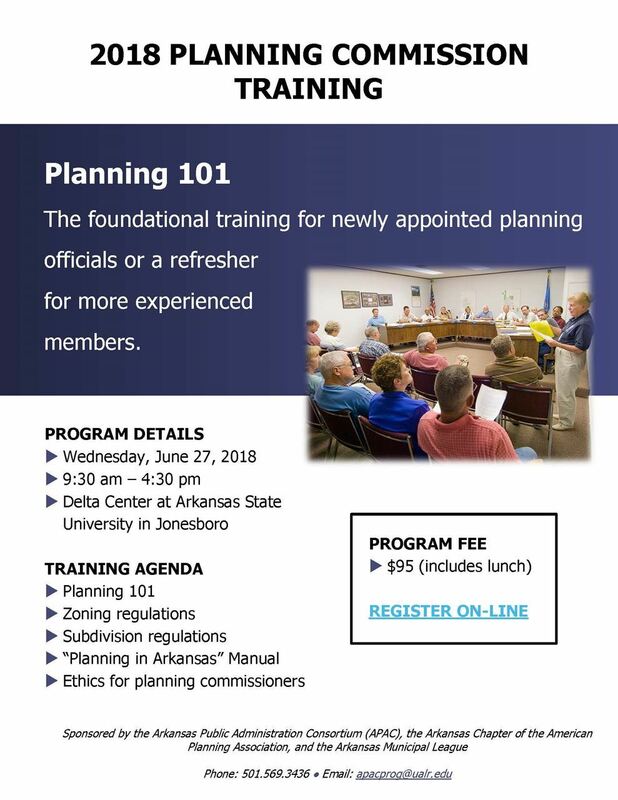 The foundational training for newly appointed planning officials or a refresher for more experienced members. Sponsored by the Arkansas Public Administration Consortium (APAC), the Arkansas Chapter of the American Planning Association, and the Arkansas Municipal League.